OMG, OMG I have been DYING to share my pajamas with you all since I got them for my trip in January to Japan. I know I talk about how much I love my clothes. But my awesome ONESIE is one of my all time favorite pieces. This one is from Jays PJs and is the bees knees! I bought a “luxury design” XL but there is plenty of room – I could easily have gone the L.
I’m toasty as can be, there’s a hood, there’s a bum-flap… What more could you ask for!! It’s short and sweet from me today, but I’ve shown you mine… it’s time to see yours!! Aussie Curves is a weekly fashion challenge for Australian and New Zealand bloggers, sizes 14+. Join in the fun! Gorgeous!! Love them! They are so cute! 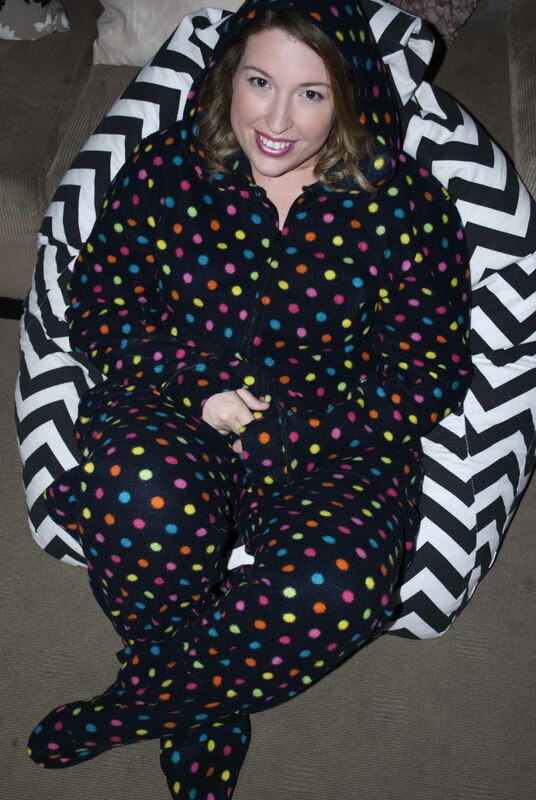 ahhh you have polka dot onsies! IM SO JEALOUS! Rockin’ the onesie! And it’s polka dot! Too cute, I love it! zomg! Its an actual proper onesie! That is amazing and sooo cute! Love the polka dots! Hi Ames – I got mine from Jayspjs.com.au they have footless as well as footed onesies. Thanks for stopping by!